‘Sleep softly, my love: in memoriam” deals with loss and remembrance in the aftermath of the 2008 bloody attacks by foreign terrorists in my hometown, Mumbai, India. 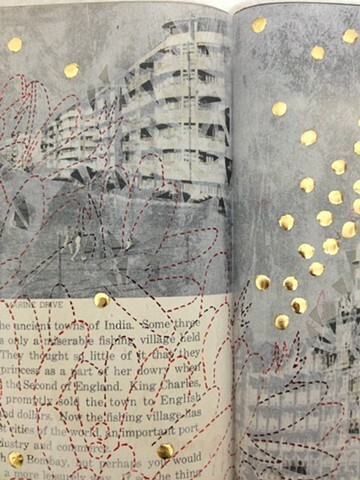 Pictured in this collaged and gilded vintage book is the historical landmark the Taj Mahal Hotel, one of the six sites that were attacked. It was also the location where my sisters wedding was to take place the next day after the attacks started, but the night the terrorists took siege, there wasn’t a wedding related event. The Taj Mahal Hotel remained under terrorist siege for over 36 hours and sustained a large number of casualties and massive interior damage. It was one of the worst attacks in recent history in India.